Learn the ONLY follow up script you ever need: Craigs Universal Call Back script enables you in three minutes or less how to determine the two most important things you want to know about ANY prospect: their timing and motivation. Craig Proctor explains to you the probing questions to ask to ask to determine who your best prospects are and the exact language you should communicate to compel them to want to meet with you. Agents who perfect this script see their face-to-face appointments with qualified prospects go way, way up. Build a safety net underneath your business by automating your follow-up systems so none of your prospects slip through the cracks just because you forgot to call them at exactly the right moment. In addition to your scheduled telephone follow up calls, Craig Proctor reveals how you can create top-of-mind awareness with your prospects to ensure that they will contact you when they are ready to act. Craig explains how he accomplishes this using multi-media that includes email, direct mail, voice broadcasting, postcards, newsletters, DVDs and more. THE ONLY Follow up Script you will EVER need. Craig Proctor reveals how he re-invented classified advertising. There is Only One Good Reason to Run a Classified Ad and Most Realtor’s ads totally miss the mark. Discover How to Create Ads and Target the Prospects You really Want to Work With. Craig Proctor provides Dozens of Examples You Can Duplicate immediately in your own business. These universal strategies compel prospects to contact you and are the foundation of Craig’s automatic reverse prospecting system. Discover how to perfect your online advertising. By using Google Pay-Per-Click, Craigslist, Kijiji, Backpage, banner ads and other online strategies, you will learn how to generate more leads at low cost or even no cost. Almost every Realtor advertises online and unknowingly makes common mistakes that suppress response. Find out how you can dramatically improve your results with no more effort by avoiding these mistakes. The Secrets to Successful Selling in Real Estate. Discover the Power of Personality, When Meeting with Buyer and Seller Prospects. How to INCREASE Your Conversion by Selling Prospects the Way They Want to Be Sold. There are 4 major personality types. The natural tendency is for salespeople to sell prospects in a fashion that would cause them to buy. You will learn how to quickly identify the personality type of your prospect so you can determine which sales style will be most effective. Discover why you have better rapport and success with certain prospects and little success with others. Understand why some prospects do business with you even when you are making the same presentation? Craig Proctor reveals that the key to becoming unstoppable is to have both a benefit packed presentation and the ability to communicate these benefits using the right sales style. Craig guides you through the psychology of personality and how he took his discoveries and adapted them to the real estate business. 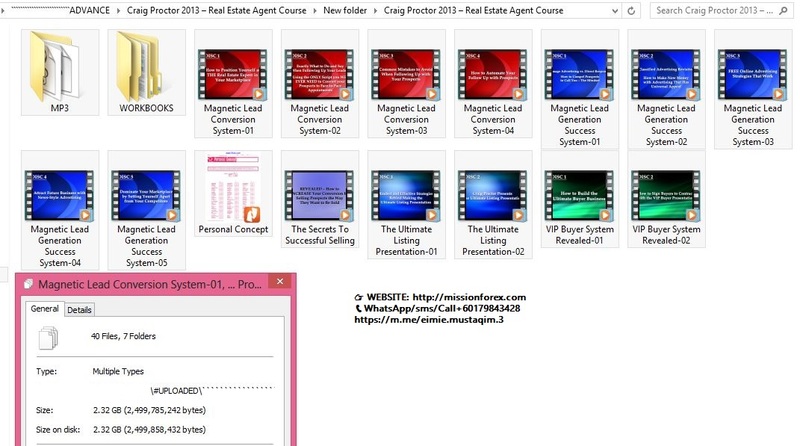 Craig Proctor presents his Ultimate Listing Presentation to you as if you are the home seller. He walks you through step-by-step the strategies he developed during his 22 years as one of the most successful real estate agents in the country. Craig will show you how to differentiate yourself from the competition by using unique services, statistics and powerful performance guarantees. He shares with you how to handle objections and how you will present your unique consumer benefits in a risk-free way. Craig’s philosophy is that the natural conclusion to an awesome presentation is the seller saying, “where do I sign”. Craig puts it all on the table and holds nothing back. In this DVD Craig Proctor reveals to you The VIP Buyer System he painstakingly developed over his highly successful career that made him the envy of the real estate industry. Craig will share with you his mindset when it comes to working with buyers including the importance of creating “your own rules of engagement”. Craig explains how he qualifies buyers upfront and then compels the best buyers to meet with him and sign an exclusive buyer agency agreement before showing them even one home. With Craig’s approach – everyone wins! You will discover how to get buyers happily doing most of the work enabling you to service dozens of buyers at the same time. With Craig Proctor’s VIP Buyer System you are guaranteed to make more money and work less. Risk Free Consumer Benefits to Compel Buyers to Work with You. "Successful Forex traders have a thorough understanding of the economic and geopolitical forces that drive the currency markets. Trade with confidence by equipping yourself with the knowledge of institutional traders. Knowledge is power!" Finally, a complete educational resource that shows you how you can stay informed of the economic events that influence the global markets each day. Get the edge by knowing which world economic indicators historically had the biggest impact on the global market. who needs to familiarize themselves with the major news announcements that take place throughout the month. For a more seasoned FX trader like myself, I really appreciate how in the CD's Chris goes through some market reactions to the news releases. It is very helpful to have these reactions explained in detail on charts by a sharp institutional trader like Chris. While I've found plenty to read relating to the definitions of news releases, I can't say that I have found more useful explanations as to the market reactions themselves. If you've been lucky enough to attend a seminar hosted by Chris (as I have) this comes as no surprise, if you have not yet had a chance to work with him in person, these CD's are a good example of what to expect. In addition to the video CD, you will also receive the "Understanding Global Fundamentals for Profitable Foreign Exchange Trading". This is a supplementary booklet that will help you to understand the global short, medium and long-term economic shifts that weigh on supply and demand for currencies. These forces will ultimately generate the price movements, major trends and reversals. A thorough understanding of economic data and global issues is important to help us identify major market shifts that will confirm our technical analysis so we can make very profitable trading decisions for short, medium and long term trades. I am privileged to be given this opportunity to share with the ForexMentor© members this incredible resource made available primarily to the largest financial entities.